On January 31, I shared with several teachers about the possibilities of using Evernote to document student learning in literacy. Led by Amber Garbe (@ReadattheEDGE), this group of reading teachers have a growth mindset. They did not get frustrated when the technology did not always work for them. I enjoyed learning with these teachers. The purpose of this post is to summarize our learning. Do you ever feel stuck when using technology? So many possibilities, when you just want to accomplish one thing? The story Stuck by Oliver Jeffers nicely describes this sense of frustration. The main character throws everything he can at a problem (kite stuck in a tree) when he should have focused on the problem itself instead of the tools. The point I made is we need to allow the students to take control of their learning. This can be accomplished by being a learner as opposed to a teacher when guiding students to become readers and writers. Our learning takes place when we are close to the source (the student). Evernote can help a teacher measure student learning with tools that help them see and hear what the students know and are able to do. They are not just a reading level. Much of this information comes from Knowing Literacy by Peter Johnston (1997). Although it was published fifteen years ago, this resource feels like it was written yesterday. He states that as assessments become more standardized and distanced from the student, the less trust and ownership there is between the student and teacher. 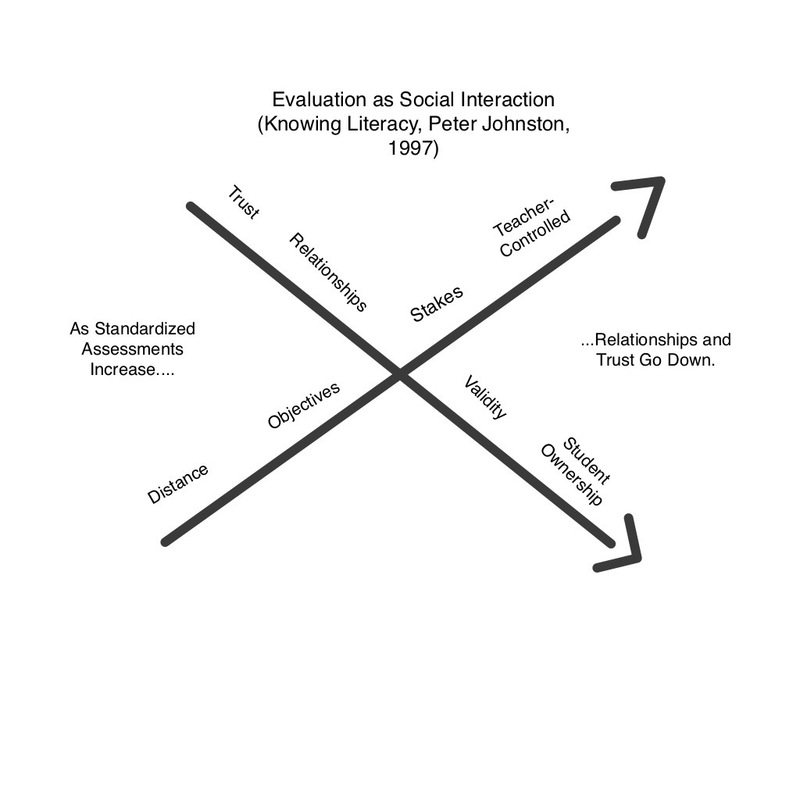 This graphic is a visual I developed to better understand this assessment relationship. Showed understanding that literacy is not always linear. In the beginning of the year, ask students questions about their reading and writing habits. Record the conversation. Later in the year, review the audio from this interview with the student and facilitate a new one to promote reflection and growth. You can find a good interview template in Janet Allen's Yellow Brick Roads. Students could use the check boxes in Evernote to list what they would like to accomplish for the quarter, semester or year. Donalyn Miller's goal for her students from The Book Whisperer of forty books from a variety of genres would be a good example. When they reach a goal, they can check off the box (and set a new goal). Although a teacher could also house students' quantitative data such as running records in a note, it's important to also develop a story of each reader's progress throughout the year. This can be one note with just a running narrative of their current reality, where they need to go, and how to get there. One incentive for using Evernote is the ability to share information with colleagues and parents. What will be most useful for them? We ended our session with each teacher sharing one takeaway from the night's session. The word that seemed to be heard the most was “possibilities”. What other ways do you or could you use Evernote to confer with readers and writers? Please share in the comments. Thanks for sharing! I find that teachers often get frustrated with the means in which they take conference notes, and rather than seek out a new system, abandon it all together. I can’t wait to add this to my toolkit. I am in fact happy to study this internet site posts which consists of tons of helpful details, thanks for providing such statistics. I am very appreciative of how this article addresses the individuality of each writer and recognizes that his or her strengths and weaknesses are not quantifiable with just one word. Proficient or struggling cannot paint the entire picture of what that student is capable of doing, their interests or their particular teaching points. I am also excited by the prospect of letting students take control of their own writing by helping them see the areas they need to strengthen their own writing and showing them how much they have grown. I am exited to hear about Evernote as an online solution for teachers to obtain a broader view of what each child wants to accomplish and is capable of doing as a writer. I think it is genius that this tool allows teachers to capture a photograph of the students work, add comments such as teacher observations, appropriate goals and the student’s own reflections as said in their own words. I also love the idea of doing initial student interviews to see where they want to go as writers. This can be potentially very empowering for the students and can help the teacher guide instruction to best suit their needs and aspirations. I also see a lot of potential in creating digital portfolios. Not only would they serve as a great assessment tool but can serve as defining milestones for each student as a writer. At my school, we are switching from a traditional scripted writing program that contains static rubrics for assessing students, to the workshop model using the Lucy Calkins program. Personally, I love how this program treats each student as a writer and pinpoints precise strengths and weaknesses, painting an in depth look at each student’s potentials and routes to help them grow. However, I am challenged by all these means and modalities of analyzing student work. The more I dive into this program the more I see the little nuances that will encourage my students to find their own voice and become stronger writers. However for this to happen, as their teacher, I need to find ways to annotate their growth in meaningful ways. After reading this article, I am encouraged by the potentials for Evernote. Looking at all the things you describe are possible using Evernote, I can see potentials for it to help me keep track of growth in other areas. I would love to know if anyone else uses it as successfully with writing, math or other subjects.